snyk test takes stock of all the local dependencies and queries the snyk service for related known vulnerabilities. It displays the found issues along with additional information. For Node.js, Ruby, Java projects, it also suggests remediation steps. To have a better control over your tests, you can pass the severity-threshold flag to the snyk test command with one of the supported options (low|medium|high). With this flag, only vulnerabilities of provided level or higher will be reported. Note: low option currently has the same effect as running without specifying the threshold, i.e. all vulnerabilities will be reported. Since snyk test looks at the locally installed modules, it needs to be run after npm install or yarn install, and will seamlessly work with shrinkwrap, npm enterprise or any other custom installation logic you have. Since snyk test looks at the locally installed modules, it needs to run after mvn install. In order to use the CLI to test against your build.sbt manifest file, you’ll need to first install the sbt-dependency-graph plugin. Error: Missing plugin sbt-dependency-graph (https://github.com/jrudolph/sbt-dependency-graph). Please install it globally or on the current project and try again. Since snyk test inspects the locally installed modules, it needs to run after the vendor/ folder has been populated via dep ensure or govendor sync. In addition, the GOPATH environment variable must be set correctly. Since snyk test inspects the locally installed modules, it needs to run after the packages/(.NET) or obj/(.NET Core) folder has been populated via Visual Studio or dotnet restore. The CLI does not currently auto-detect .sln files, so for .NET and .NET Core projects you can specify in the <code">--file parameter the location of the solution file and the CLI will run on all the projects it finds inside. Since snyk test inspects the locally installed modules, it needs to run after the composer.lock file has been created by composer install. To test a public Github repository, run snyk test and include the Github URL to the repo. This also works for Bitbucket and GitLab. You can also use snyk test to scrutinise a public package before installing it, to see if it has known vulnerabilities or not. Using the package name will test the latest version of that package, and you can also provide a specific version or range using snyk test module[@semver-range]. You can pass variables to snyk test running on Maven or Gradle projects. This is useful when you want to test a specific profile (in Maven) or configuration (in Gradle), or pass system properties. This is done by sending flags after a double-dash option when running snyk test. Note that all flags after the double-dash option will be used as Maven or Gradle flags. After running snyk test you will presented with a list of vulnerabilities, including the severity, a description of the issue and a link where you can learn more about the specific vulnerability issue. Depending on the language of the project you have tested you may also see remediation advice providing details on how you can manually fix the vulnerability. 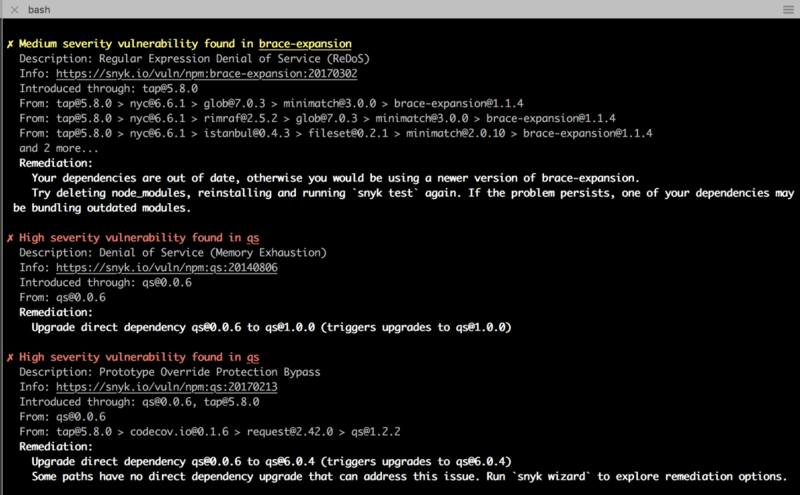 If you are testing a node.js or yarn project you can also use snyk wizard to fix your project. Tests against open source projects are free and don't count towards your test usage. If your source code is available publicly on the internet, you can mark your project as open source by following these steps. Enter a git URI to the source code for your project where it says “Git remote URI”. If your code is hosted on GitHub, you can find this by clicking the “Clone or download” button and copying the URI. If we are able to verify that the URI points to a git repository then your project will be marked as open source and will no longer be tracked against your private project test usage.